Other post titles we considered were “The highest and the coldest” and “Valle de la Luna”. 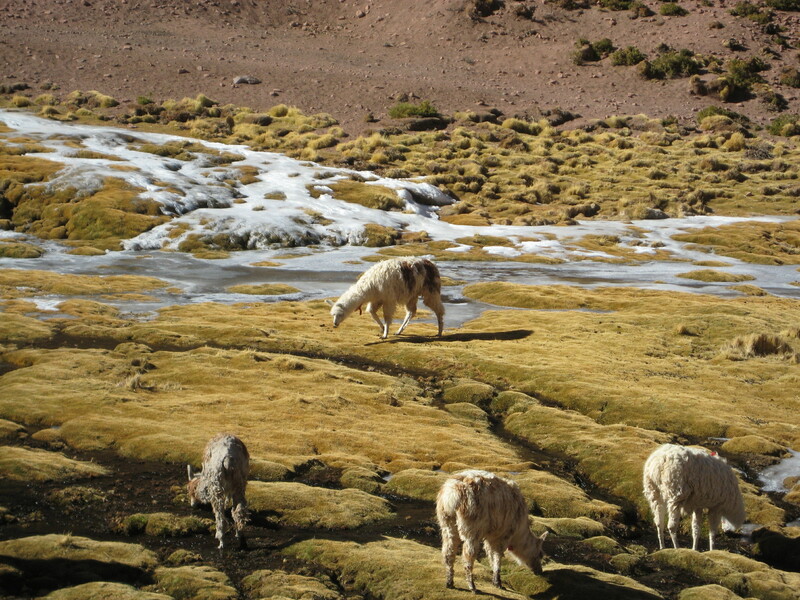 We are coming to the end of our second full day in San Pedro de Atacama, and here are some brief thoughts. 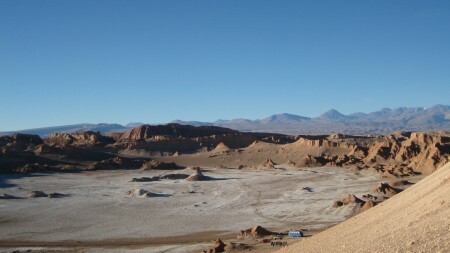 This is a little pueblo in the north of Chile, in the Atacama desert (as the name implies). The population, including tourists, is somewhere around 5000. I think the continuous population is only 2000 though. The streets are hardened dirt, there is basically one main road, and it’s very dusty. Walking 5 minutes takes you anywhere in town. It’s pleasant during the day, and quite cold at night. All the storefronts look basically the same - adobe walls and chalkboard signs telling you what they offer. Inside, however, the various businesses are quite different and interesting and nice and full of character. We haven’t wasted a minute in this town. 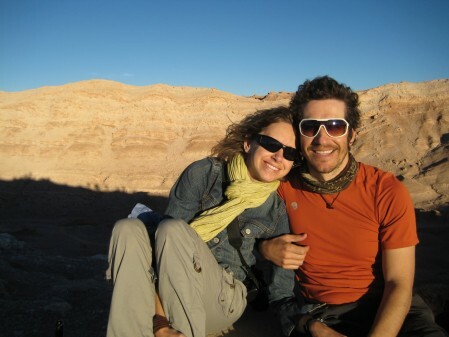 Yesterday we rented bikes (4th time on the journey so far) and rode the 30 km (there and back) to Valle de la Luna. This is a national park nearby, with moon-like landscapes, hence the name. 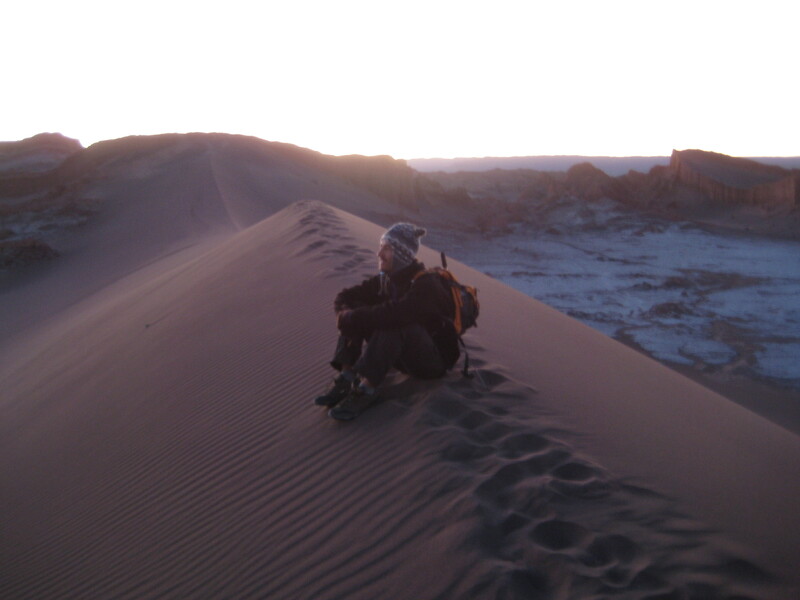 The highlight is a giant sand dune that everyone gathers at to watch the sun set. Annoying to have 50 other tourists there with you, but it was still beautiful. We even met a retired couple from the US, with the husband being an astronomer (Caltech PhD back in the day) who’s working on a telescope near here. So we sat and enjoyed our bottle of wine we bought from a bodega in Mendoza back in Argentina and have been schlepping around til now. It was delicious, even straight from the bottle sans cups, or “sin copas”. 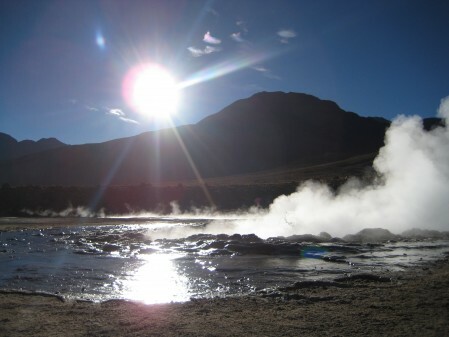 Today we took the Geysers del Taito tour, leaving at 4 am with 8 others in a Hyundai van. The driver (our second named “Sergio” so far) was friendly and spoke no english. Guess that’s why it was cheaper than the other tours. 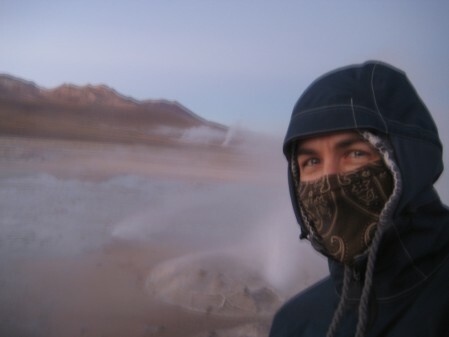 We arrived in bitter cold (4 F, -14 C) temperatures before sunrise, and we could only handle a few minutes outside the van at a time. 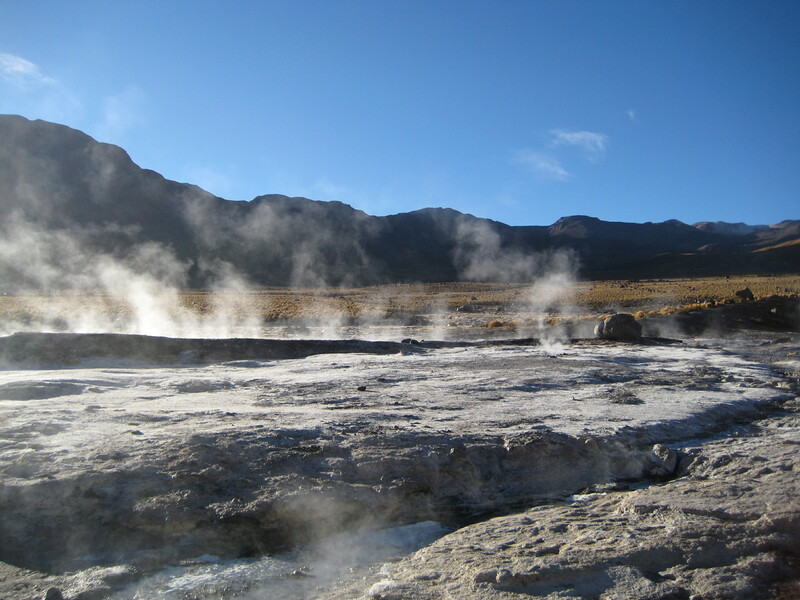 There was a field of geysers amidst salt crystal covered ground. And ice because it was damn cold. I learned that these are the highest elevation geysers in the world, while of course Yellowstone in the US has the highest shooting geyser. We sipped our Nescafe and ate our pan (bread). After shivering there a while, we moved on to another field, which had a pool collected from one of the geysers. I, of course, had to jump in and swim with the rest of the idiots. It looked so warm because of all the steam coming off it, but it was still a tepid 75 F at best! And oh baby was it cold getting out. Totally worth it though! Not as warm as I'd hoped! 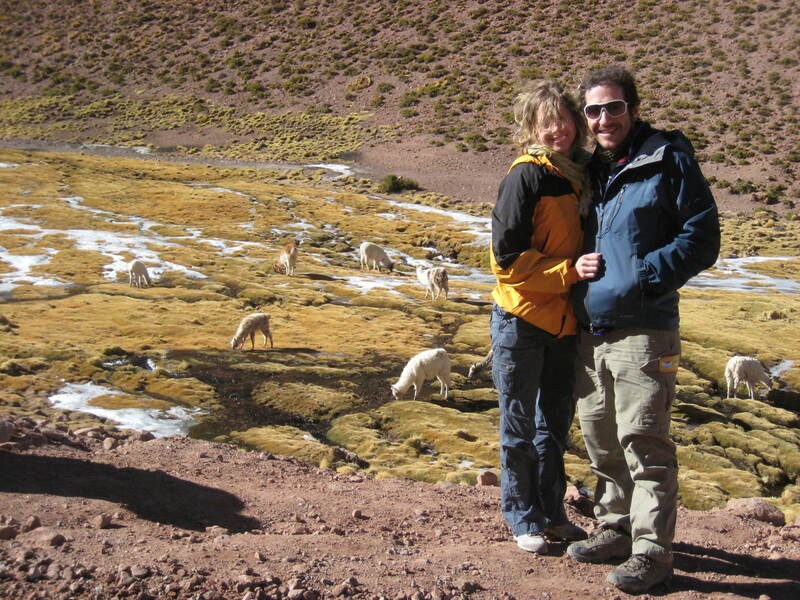 More driving, sightings of wild vicuñas and domesticated llamas, ice covered streams with weird Andean birds, and a stop in a little pueblo where Monica ate her first llama meat (to her knowledge), and absolutely loved it, going as far as to say it was the best meat she’d ever had! Now we’re ready to leave Chile and head out into the more rugged (and cheaper) Bolivia. We’re doing a 3 day, 2 night jeep tour through the altiplano and the world’s largest salt flat. The Lonely Planet book describes it as having “mind-altering vistas”. No drugs required.